In the mid Victorian period the Rev Dr Horlock, vicar of St Thomas à Becket Church of England, arrested a Methodist minister who was preaching outside his allotted Non-conformist area. The battle for the heart and soul of of the Established Church was divisive rather than inclusive and it grew increasingly bitter. Few would have foreseen a peaceful resolution of the dispute. This article explores the contribution of a single person, Methodist Edwin Bow, to achieve an amicable outcome to the dispute, not by legislation or bureaucracy but through the strength of his commitment to his own family, the whole community of Box village and his remarkable personal integrity. If we look for role models for our own behaviour and morality, we would scarcely do better than following the example of Edwin Bow. Right: Edwin in his GWR signalman uniform would have been a common sight in Box village. Edwin Bow came from very humble beginnings, despite the esteem in which he eventually achieved in Box. Born 24 September 1862, in the village of Chetnole, Dorset, Edwin came from a large family of labourers. His father, John Bow, was a stone sawyer and agricultural labourer, and his mother, Mary Hillier, was the local seamstress. Edwin grew up in a substantial family, with five older brothers and an older sister, in close proximity to much of his extended family, including his elderly grandmother, Hannah Bow, who lived three doors down. Chetnole was an extremely small community with a population of around 150. In the late 1860s, the Bow family moved to the nearby town of Yetminster, which had a population about a third the size of Box’s. Edwin’s father, John, was a very religious man, and raised his children to be staunch Methodists. Every Sunday was dedicated solely to church and prayer, and Edwin continued this practice throughout his life. After leaving school around the age of 14, Edwin got a job as a stable boy at Inwood House, in Henstridge, Somerset, working for the industrialist Thomas Merthyr Guest, Justice of the Peace for Dorset and Somerset, whose family firm subsequently became part of the iron and steel firm Guest, Keen and Nettlefolds (GKN). Edwin's responsibility was to care for the horses, collecting their food and water, and cleaning out their stables. Thomas Guest was a very wealthy man with powerful connections; his wife was a daughter of the Marquess of Westminster. Guest’s wealth is evidenced by that fact that, despite having a family of only four, he employed 29 servants to run the house. As stable boy, one of the lowest positions in the house, Edwin was forbidden to have any contact with the Guest family. This environment would have starkly contrasted with the small, close-knit community Edwin had grown up in. Edwin worked at Inwood House for several years before making the decision to move to Wiltshire in the mid 1880s. The exact reason for his move is not certain, but it is likely he came for work, particularly for the Great Western Railway, having possibly been influenced by the railway which came to Chetnole when he was just one year old. Edwin settled in Pickwick and became an employee of GWR, probably working originally at Corsham Station. Edwin’s role at GWR was as a signalman. It was his job to monitor the timing and movement of each train to prevent accidents or collisions. Fairview Cottages in 1912 and Claremont, 5 Valens Terrace in 1915 where they had seven children, five daughters and two sons. Edwin lived there for the rest of his life. Edwin experienced a long and eventful career with the Great Western Railway, moving from Corsham Station to Box, where the signal box was located at the Box side of Box Tunnel. It was here that one of the most dramatic events of Edwin’s career happened. On Saturday 16 September 1893, a serious collision occurred inside Box Tunnel when the London - Bath express train, the Wigmore Castle, came off the rails inside the tunnel, and second train travelling in the opposite direction crashed into it. At the time of the accident, Edwin was in his signal cabin and it did not take long before he realised that the train had not exited the tunnel on time. As stated in The Bath Chronicle: (Edwin) concluded something was wrong and promptly telegraphed up the line to stop all down trains to prevent any further collisions. Ten minutes later, two men emerged running from the tunnel towards him, causing Edwin to assume the worst, that there had been a terrible tragedy. They told Edwin what had happened, but did not know the extent of injuries or casualties. Edwin knew that if any more trains entered the tunnel it would be disastrous, and he began contacting officials at stations throughout the line, including Bristol, Paddington and Swindon. The newspaper reported it as An Alarming Collision on the Great Western Railway where it was marvellous that many people were not killed on the spot and Edwin’s quick thinking and attentiveness potentially averted a much worse disaster. A shunter driver at the Box Station stoneyards, Mr Wiltshire, was the first to reach the crash and spoke of the cries of the wounded, and the shrieks of the terrified women and children. Both engines were newly-built but were totally destroyed, the frame of one locomotive is doubled and twisted as if it were the cover of a sardine tin. Edwin’s sons, Edwin Jr and Leonard John (Jack) Bow, followed him into jobs at GWR. Edwin Jr joined the army in 1912, and went on to fight in World War I, reaching the rank of Corporal and surviving the war. In 1918, Edwin Jr was transferred to the Royal Engineers and became a signalman on military railways. Edwin’s younger son, Jack, joined the army during World War II, eventually becoming a Sergeant. Despite his long career with GWR lasting over forty years, Edwin’s legacy to the village was his contribution to the Methodist Church over a period of fifty years. A lifelong Methodist, Edwin was quick to associate himself with the church when he moved to Box in 1891. He was part of the group that helped rebuild the Methodist Church on Chapel Lane, likely present at the celebrated laying of the foundation stone in 1896. The opening of the church in 1897 was a very grand affair opened by Lady Dickson-Poynder and attended by Mr and Mrs Fuller of Neston Park. 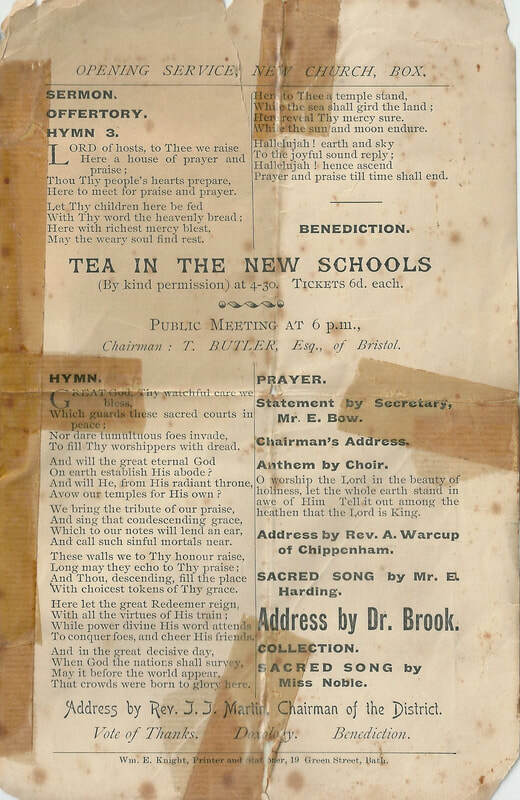 The service was followed by tea in the New Schools (Church of England) and a public meeting at which Edwin gave a statement as Secretary. The Wiltshire Times stated Mr E Bow then gave a brief account of the undertaking and also the financial statement. He acknowledged the help which Mr CJ Pictor had rendered in connection with the construction of the chapel, and in referring to the free labour of the members of the congregation said on some occasions women were to be seen at work on the site of the chapel, pulling what was known as a "five-footer”, a name given by the quarrymen to a saw worked by one handle. 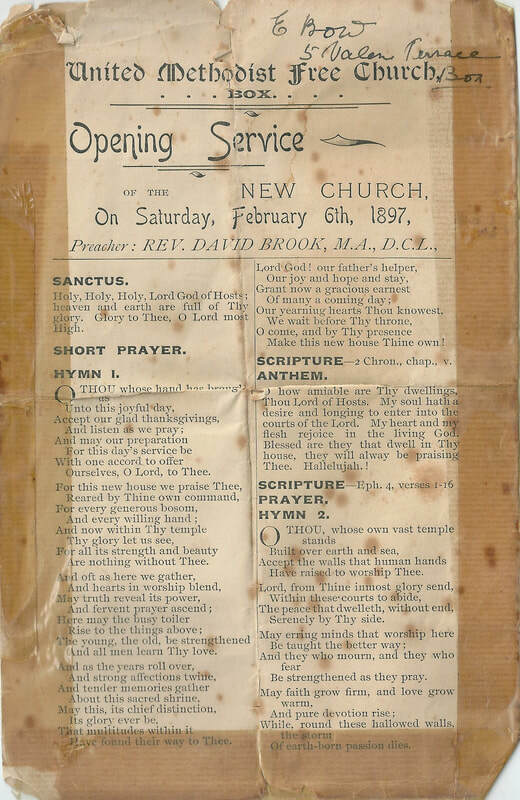 Once the church had opened in 1897, Edwin was given the role of church secretary in addition to his work as Superintendent of the Sunday School and choirmaster. Edwin became known for his significant charity work. Starting in 1912 and lasting for the next 23 years, for the week before Christmas, he led a group of carollers around the village, which raised £430 to be shared between the charities of National Children's Home and Orphanage and Dr Barnardo's Home. According to the Wiltshire Times, during a speech about the annual carolling in 1935, Mr Bow illumined his interesting remarks with bits of humour of the experiences of the carol singers. [25 years] ago the roads… were not kept in such a good condition as now and parties had been known to return home having left their footwear in the accumulations of mud, and… there was a story told [that] one man held tightly to his wife on his arm for fear of losing her. Similarly, Edwin started the annual village Easter Egg hunt, which raised money for the Royal United Hospitals, Bath, and in 1934, alongside his wife Annie, led efforts to raise money to pay for repairs to the church organ. In 1938, Edwin was one of the main organisers of the Busy Bee-Hive Bazaar, to raise money for the church. Edwin also often sang at the annual Harvest Festival, in 1936 performing a duet with his step-daughter. Edwin was widowed when his wife, Bessie Bow, died in 1921 at the age of 53. A few years later, Edwin became engaged to Annie Lucy Greenman. Annie’s first husband, Herbert Harry James (John) Greenman, had died in 1922 from complications involving injuries he sustained during World War I. Edwin, due to his roles in the church, had been present at Annie and John’s wedding in the Methodist Church in 1905. Annie and Edwin married in the winter of 1924, also at the Methodist Church. As well as his new wife, Edwin welcomed Annie’s four young children into his household. Edwin was known within his family as quite a strict man, particularly when it came to religion. On Sundays, his family were strictly forbidden to do any recreational activities and had to focus on church and prayer. 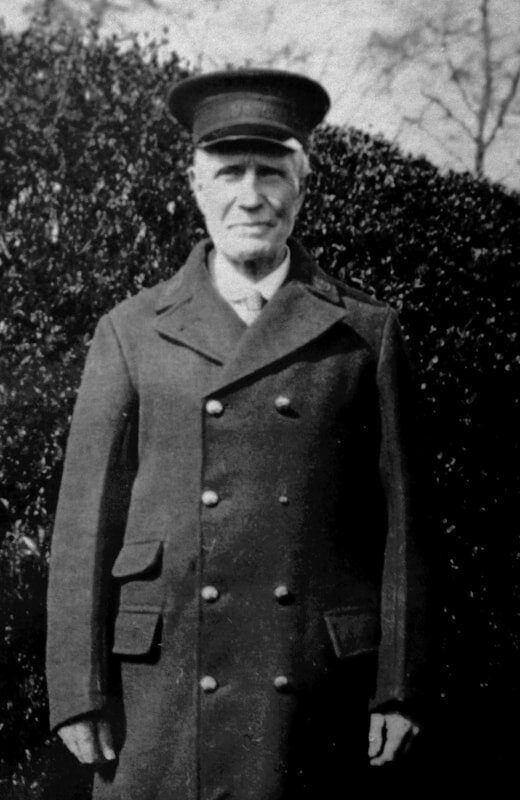 Edwin retired from GWR in the mid 1920s, but maintained an active role in the Methodist Church. One of Edwin’s step-daughters, Nellie Greenman, played the organ in Box Methodist Church during the 1930s. In later life Edwin also became a keen gardener. In 1940, Edwin was awarded a certificate for his contribution to the church but in February 1941 he suddenly became ill.
22 February. His favourite hymns Lead, Kindly Light, For Ever with the Lord and concluding with The Homeland were played on the organ by Mrs Hubert Sawyer. Many of the villagers in Box attended his funeral with representatives from the Methodist churches at Kingsdown, Corsham, Bath and Box Hill. In his tribute Rev Norman Page said as a local preacher he [Edwin] had a great ability - and also as a leader. Rev Page also spoke of the respect and great affection and of the happy memories most inhabitants of Box had for Mr Bow. Edwin was buried beside his first wife, Bessie, in Box Parish Council Cemetery. Sadly, he does not have a tombstone and is in an unmarked grave at plot 167 of the parish cemetery. Perhaps he wanted it like that. Edwin Bow's life covered a defining period in Box. He was a pillar of stability in the village in a period spanning the rebuilding of the old Ebenezer Methodist Chapel until the start of the Second World War. Life changed significantly in Box but throughout those years Edwin remained true to his personal beliefs, raising money for children's charities, teaching youngsters at the Sunday Schools and choir, and devoting his spare time to gardening at his beloved 5 Valens Terrace. He helped to establish the community spirit which is still enjoyed in the village and the evidence for this is in the rebuilding fund for the Methodist organ where the local newspaper said "Box is a village where the happiest relations exist between Church people and Non-conformists". If you haven't realised, this tribute to Edwin Bow was written by his eighteen year-old descendant, Oliver Moules from Box who attends Corsham School. A remarkable achievement; Edwin would be proud ! Samuel Bow (1786 – 1848) married Hannah Foot (1785 – 1877) on 6 April 1808, in Melbury Bubb, Dorset. Samuel was from Stockwood, Dorset, and Hannah from Sturminster Newton, Dorset. Both died, and were buried, in Chetnole. Hannah lived to be 92, a very impressive age for the time. Robert Hillier (1792 – 1857) married Elizabeth Fox (1786 – 1833) on 12 October 1812, in Minterne Magna, Dorset. Robert worked as a thatcher, building thatched roofs. Elizabeth died in 1833, and Robert quickly re-married to Lydia Michel on 30 June of the same year. John Bow (1821 – July 1890) married Mary Hillier (1820 – April 1887) on 17 December 1849 and had seven children. John was born in Chetnole, and at various points throughout his life worked as an agricultural labourer or a stone sawyer. Mary Hillier was born in Shaftesbury, Dorset, and worked as a seamstress during the 1860s. Both died in Yetminster. (11 September 1902 – 1986); Eva Bow (1903 – c1988); John Leonard (Jack) Bow (23 October 1909 – 1978). Edwin married in 1924 Annie Lucy Greenman (nee Wootten) (24 February 1884 – 24 June 1974). Arthur William John Greenman (31 October 1907 – 1986), who married Ivy Smith; Margaret Lucy (Mag) Greenman (25 January 1910 – 1994), who married William Tiley; Nellie Greenman (22 November 1911 – 25 October 2010), who married Bert Moules; Emmeline Dora Greenman (29 October 1915 – 5 January 2000), who married Alec Smith.